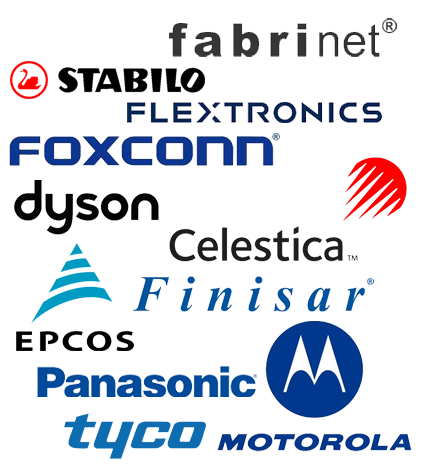 We served mainly the Electronics and Electrical-Electronics Industry, and 80% of our products are exported worldwide to Germany, Italy, USA, China, Singapore, Australia, New Zealand and many more. We also as 3rd party supply to HEWLETT PACKARD. Hand phone Antennas, Two-ways Radios, Hand phones accessories, Automotive safety Airbag, Vacuum cleaners, Electronics organisers, Printers, Colour display tubes, Optical modules (transceiver), Rechargeable industrial battery packs, Cameras, Lamp and lighting, Consumer electronics, Power breaker/transformer, Electronics components and others.